TRENTIN, Maurício. Communication and relationship possibilities between works of art and their interpreters as a base for categorizing contemporary production. São Paulo. 2010. p. 154. Post-Graduate Program in Communications and Semiotics_Pontifícia Universidade Católica de São Paulo COS-PUC.SP _book 2: Maps for imaginary lands. Thoughts on relational mechanics and aesthetics categorization. The research aims at developing a new structure for mapping and analyzing works of art starting with their communicational characteristics. It is based on the hypothesis that there are possibilities in readership, understanding and categorization of objects of art in contemporary production that can be reached by the analysis and interpretation of communication aspects between interpreters and works of art; out ofwhich possible relationship patterns arise. 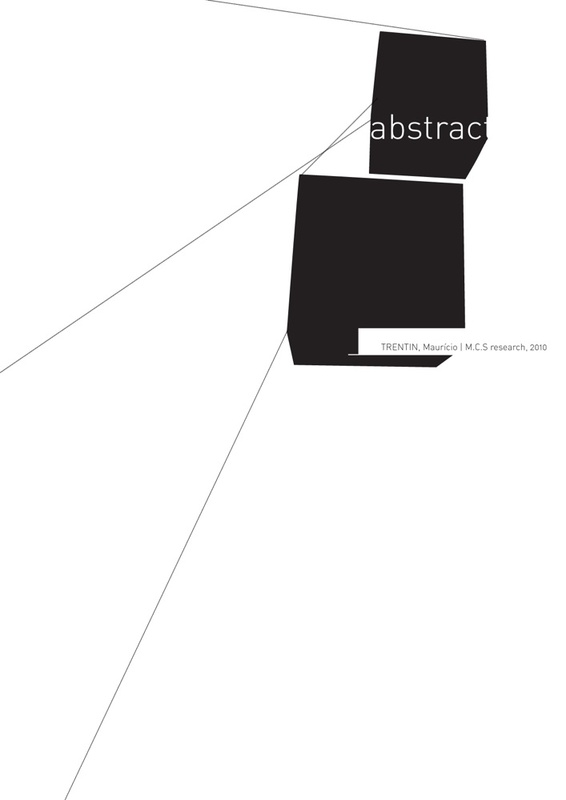 From a methodological point of view, the research is based on bibliographic research, presentation of works that present the communication categories and possibilities and artwork creation, a way to expand the discussion to other medium and interfaces. The goal is to verify the relationship possibilities between the immaterial counterparts of the objects, their meanings, and the observer. The logic is that the communication relationship between the work and the interpreter could permeate different media, the media being no more relevant than the main components of comprehension and readership, the meaning that the works carry and the way in which these meanings are learned by the interpreter. Even when the choice of medium is made in direct relationship with the subject matter, criticism or poetics of the work, the immaterial representation engulfed by the object and noticed by the observer is paramount to the comprehension of contemporary art. Analyzing the implications and theoretical relationships of the proposal, the dissertation aims at establishing discussion about the real space of the contemporary art experience, its communicational and relational scope, the contact between meanings and interpreters. The hypotheses, therefore, is presented by the means of two discourses: theoretical/analytical and artistic. In the artistic discourse, a series of works that operate in different levels of contact with the observer will be created and presented. In the theoretical discourse, relational categories created stemming from the communication possibilities between interpreters and contemporary works of art will be proposed and have their general validity accumulated with the presentation of relevant theoretical relationships. From the theoretical point of view, the discussion is built on the concepts of post-historic art of A. C. Danto, contemporary art of C. Cauquelin, Peircean semiotics based on the reading of L. Santaella, and the crucial importance of the interpreter, initially indicated by Duchamp, to investigate the possibilities of communication in contemporary art. It shows that the categorization of an artistic production is possible as long as the parameters are communicational/relational (Peirce’s universal categories applied to the work/interpreter relationship, perceiving works as interfaces between artists and interpreters, close to the Cultural Interfaces, in Manovich’s terms, however not necessarily digital), take into consideration specific interpretations and aren’t based exclusively on the physicality of the works.